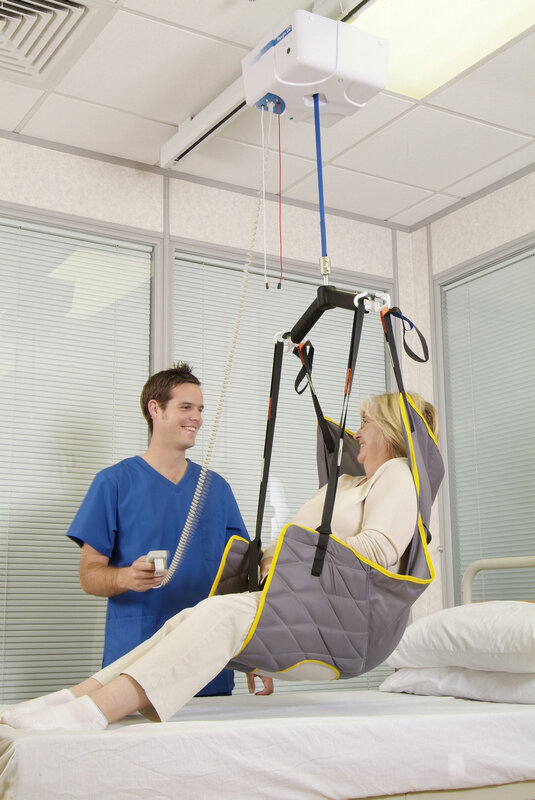 Dolphin supply and install a diverse range of ceiling hoists made by the world's best patient lifting manufacturers. Ceiling hoists are overhead hoists which are normally fixed to the ceiling but can also be wall mounted. Overhead tracking is permanently installed and the hoist motor traverses along this track. Straight and curved sections of rail are available along with a host of other options such as turntables, XY systems or H frames, exchangers and gates with which to connect tracking between rooms. Handi-Move have a host of innovative solutions for lifting people. The body support system can be used for quick and easy transferring independently or with assistance. People that require more support can use a conventional spreader bar and sling system. The hoists are suitable for intensive use and have a life span far greater than most ceiling hoists. It is the quickest lift on the market and can be fitted with a powered traverse motor and wireless controls. Arjo Ceiling Lifts have for a number of years offered a stylish and economical solution to the problem of patient lifting. The V5 Duo ceiling hoist has a lifting capacity of 200kgs (31.5 stone) which can be lowered to 100kgs (15.75) if necessary. The Voyager 420 ceiling lift is an easy to use hoist which is suitable for the majority of manual handling requirements. With a maximum user weight of 190kg (30st/420lbs) the 420 is widely used in hospitals, schools, care homes and in domestic settings.